Pinellia ternata, also called crowdipper, is a weedy member of the Araceae family and used to be sold as an ornamental. Native originally to Japan, this corm has become an invasive pest in the United States, establishing populations in California and the northeast from Ohio through Connecticut. Here at the Scott Arboretum, we are attempting to eradicate this persistent weed which has been taking over gardens throughout campus. 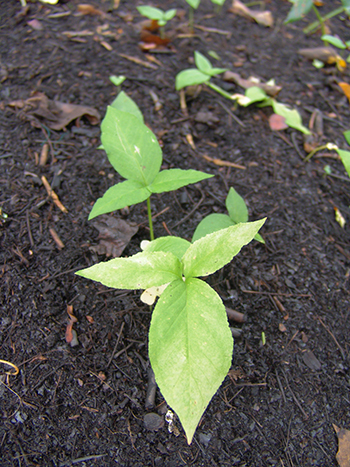 Its leaves are usually trifoliate with oblong leaflets, but can also be pedate with 5 leaflets. The inflorescence is similar in structure to others in the Araceae family, with a green to whitish spathe surrounding the hermaphroditic inflorescence, which is green to violet in color. Known widely by its common name ninebark, Physocarpus opulifolius is a large garden shrub with multi-season interest. 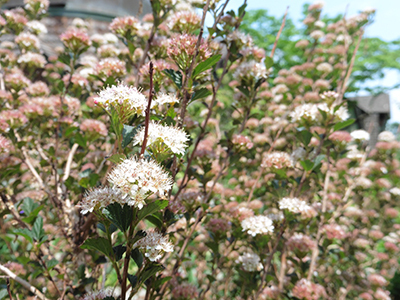 With an arching growth habit and wine-colored foliage, this shrub adds a unique element to any space with full sun. It blooms in late spring with clusters of small white flowers that stand out against the dark-purple foliage. Branches of the flowers are often used as accents in cut-flower arrangements. The blooms mature into clusters of reddish berry-like fruits which persist into the winter months. Paeonia ‘Bartzella’ is a very sought-after Itoh hybrid peony. 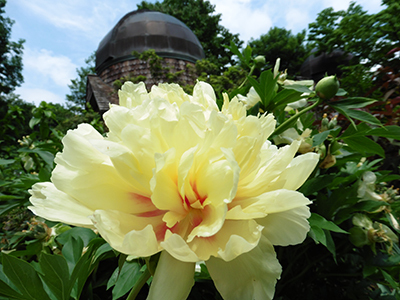 An Itoh hybrid is a peony produced by crossing an herbaceous species with a tree species, an immensely difficult task. It took Roger Anderson 12 years and many unsuccessful crosses to develop this coveted yellow Itoh peony. ‘Bartzella’ in particular is best known for its incredible flowers. The bright yellow blossoms develop red stained centers and reach 6 to 9 inches in diameter. Furthermore, a mature plant may develop over 60 blossoms in a season; some growers even boast 90 blossoms in a single season.